Jio is offering a cashback of up to Rs 799 exclusively for its Prime users. 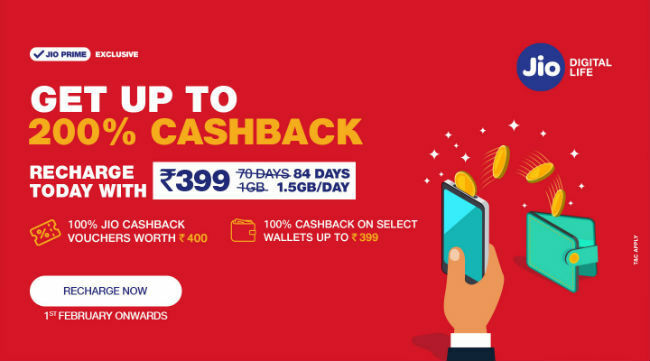 The cashback is divided into Jio vouchers worth Rs 400 and wallet cashback of up to Rs 399. 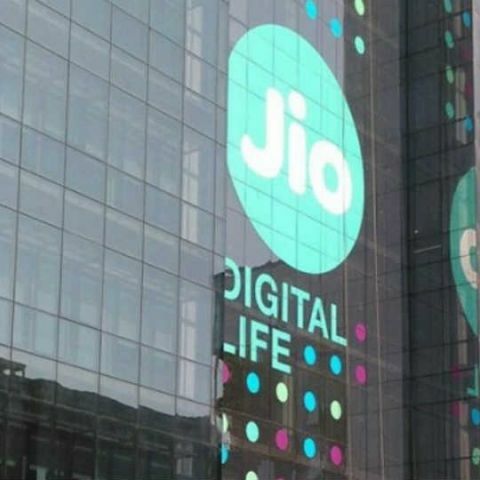 Reliance Jio has announced a new cashback offer for its prime subscribers. They can now avail up to 200 percent cashback, worth Rs 799, on recharging their connections with prepaid plans priced at Rs 398 and above. The new offer is eligible for new and existing customers and it should be noted that it is valid only till February 15. The telco has also partnered with various digital wallet services for providing the cashback. 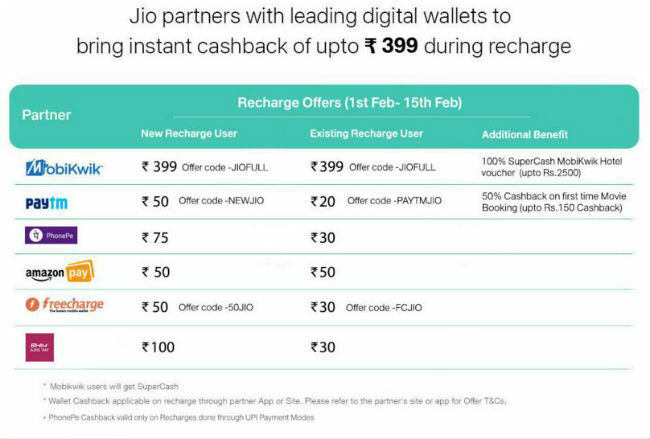 The cashback is divided between Jio cashback vouchers worth Rs 400 and users can also receive up to Rs 399 by paying via Jio’s partner digital wallets. The vouchers will be credit back into a users account immediately in the form of 8 vouchers, each worth Rs 50. They can then be redeemed one at a time while performing subsequent prepaid recharges or while purchasing data add-on packs. They can be accessed under the My Voucher section in the MyJio app and users can perform a maximum of 5 recharges for availing the offer. Users who recharge using MobiKwik, Paytm, Amazon Pay, PhonePe, Freecharge, and Axis Pay will also receive an additional cashback of up to Rs 399. Both new and existing users of Jio Prime users will receive a Rs 50 cashback by paying via Amazon Pay whereas with Paytm, new and existing users will receive a Rs 50 and Rs 20 cashback respectively. As added benefits, MobiKwik wallet users will also receive a hotel voucher worth up to Rs 2,500 on top of Rs 399 cashback (as supercash), while Paytm users will receive 50 percent cash back (of up to Rs 150) on first-time movie ticket bookings.